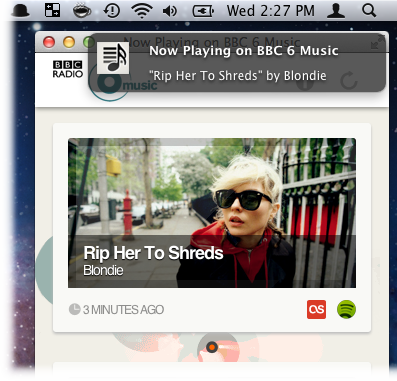 Think of it as your 6Music companion (intending for more stations in the future). Updating along with the currently playing track, pulling in artist artwork, bio’s, external links and searches Spotify for you as it goes. I really like listening to BBC 6Music, and I often found myself hearing a new track & wanting to know/hear more or add to my Spotify favourites. This site gives me that on my phone if I don’t have my laptop to hand, in a browser tab when I do and as is more often the case, on my tablet whilst cooking in the kitchen. Great, then you have the option of converting this site to a desktop app using Fluid App. Simply download, create a new app using this URL: http://nowplaying.jameswragg.com/ and you’ll have the option of seeing Growl notifications of the tracks, or placing the UI in the menu bar. Unfortunately I can only update so often due to limitations from my hosting provider & that I have to poll Last.fm (there's no real–time stream). I know it’s not ideal, I'm working on it. Any suggestions on how to improve this please let me know. Sometimes tracks/playlists aren't scrobbled (published) to Last.fm, I believe this is due to the show being pre-recorded or the DJ going off–piste. Daytime and early evening shows are generally updated fine. This site is in no way officially connected or affiliated with the BBC, Last.fm or Spotify. Any thoughts, questions or bugs I’d love to hear from you, thanks! — James.